More than 78,178,506 beer lovers served! Hours: Monday-Thursday 8:00am-11:30pm, Friday-Saturday 8:00am-midnight, Sunday 11:00am-10:00pm. Their "Degu-Bier-Set" goes for CHF 8.50. Red-brown, slight haze. Moderate head. Medium body, smooth. Lots of bready, biscuity malt. Mild hop flavor and bitterness. Diacetyl, but not as much as the Hell. Definite alcohol character. Bright golden. High carbonation. Thick head. Light body, smooth. Lots of malt, lots of butter. Light-medium body, fizzy. Sweet, roasty, and oxidized. Astringent, grassy finish. Dark dark dark red. Dense head. Medium body, low carbonation. Some malt and some roastiness are overwhelmed by the diacetyl. Red-brown, opaque. Good dense head. 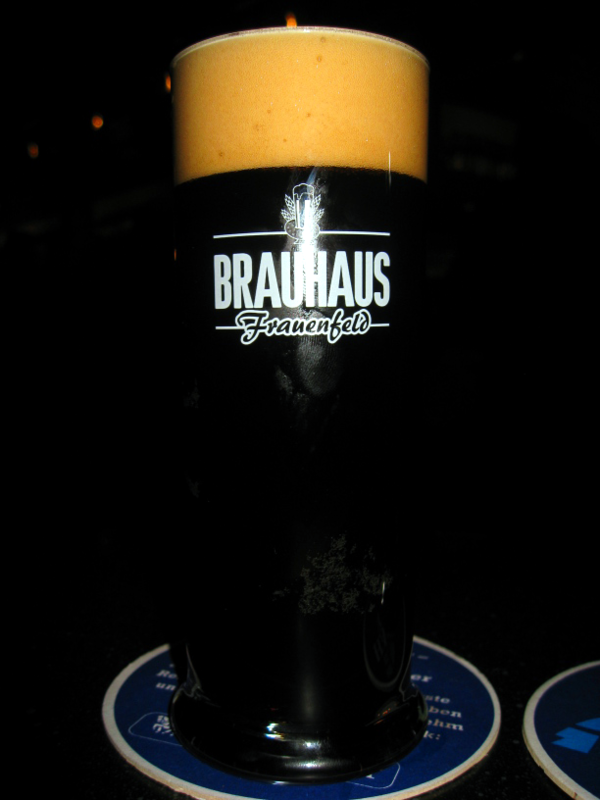 Some dark Munich malt, some mild clove spiciness. Medium body, smooth. Lots of bready, biscuity, spicy malt flavor. Hint of bananas, some cloves. Very little alcohol character compared to the Honey Brown. Finishes clean. Yellow, lots of haze. Thick dense head. Mild wheat malt, even milder clove. Light body, creamy. Smooth wheat malt character with a big banana flavor. Sweet, but not too sweet.